I am going to be very honest with you....I am a really grumpy middle aged woman who's not particularly fond of Christmas. I bet that made your jaw drop. I will shock you even more...I am a retailer who dislikes the whole commercialization of Christmas, but I will save subject for another newsletter. So, where do I start to explain myself? I think its a lot to do with nature, and a little to do with nurture. I suppose 'nature' is simple and easily explained. I am actually a really quiet, self contained person, officially titled, an introvert. Attending parties, social events, or meeting new people drains me. Yet, isn't it strange, I love chatting away to customers in my store, its enjoyable, energizing and it's what I am good at. Having had a 'good yak' all day at the shop, I go home and relish a spot of solitary gardening, some knitting, or a lovely walk on the beach with Harry, my Labrador. So, as the festive season approaches, you won't find me inviting twenty close friends around for Christmas morning drinks or sipping champagne with hundreds of revelers on New Years Eve. My strange 'Bah Humbug' (colloquialism for miserable) characteristic is also down to the nurture. I have always looked back on my child hood Christmases as magical times. Growing up in England, the build up began at school, towards the end of the second week in December, rather than in early November as nowadays! Our traditional, no nonsense lessons became interleaved with more exciting activities. After a stressful spelling test we would make our calendars. This involved cutting up past years Christmas cards, in those days cards were predominantly of religious scenes. A nativity scene would be stuck onto a colorful piece of sugar paper, an few extra blobs of glue were applied and then sprinkled with glitter. That was the magical part! Then, a tiny booklet style calendar was attached to the bottom. In my neatest handwriting I would sprawl 'Happy Christmas Mum and Dad' using my sharpest Crayola crayon. I thoroughly enjoyed embroidering my sister a book mark on large count Aida fabric, using long lengths of red and green wool. For my brother, festive shades of paper raffia were woven in and out to create a bowl. The paper stained my hands and my dress. My brother showed little delight in his hand made gift, he would have preferred a Mars Bar. At our daily morning school assembly, the hymns were replaced by Christmas carols and on the final morning a Nativity play enacted on the stage. I was not part of this. Only 'The Popular s' got the chance to wear blue curtains and striped tea towels and huddle around a straw filled shoe box holding a 'Tiny Tears' doll. By the laws of 'natural selection' a small, shy child with a dodgy short hair style had no part to play in a reenactment of Christs birth! I never got chosen for the netball or rounders team either, and sat alone on the coach going on school trips! On the last possible Saturday before the magical day, my Dad would drive his Ford Cortina to the hardware shop and select the cheapest, and what I thought was the most miss shaped Christmas tree, (that was why it was cheap). A battered bucket would be brought from the shed, filled with sand or soil from the garden and the tree plonked in it. Our tree stood proudly upright for a day or so, then took on an alarming lean to the wall. Mum protested it would damage her flock wallpaper. Within days the pine leaves would start to drop and find their way through our socks and just about all over the house. Along with the tree, Dad would collect the TV and Radio Times from the newsagents. I would eagerly turn the pages underlining the programs I wanted to watch: Tom and Jerry, Laurel and Hardy,The Railway Children, Bambie and Chitty Chitty Bang Bang. They were all 'reserved'. My brother would then draw a vivid felt pen circle around his choices: snooker, football matches and James Bond movies. His choices always seemed to be on the other channel at exactly the same time as mine. I'm sure I managed to watch some of my programs, but the sound of a dreary football commentary seem to fill my Christmas memories rather than the "drip, drip, drip little April showers" from the Bambie movie. We three children would write a list for Father Christmas, I'm not sure mine ever got to its destination, my sisters certainly did! She found a wooden recorder, a makeup box and a bottle of '4711' perfume under the tree. I recieve the board games Frustration, and Mousetrap, these were games requiring more than one person, my brother and sister were not interested in joining me. Why didn't Santa bring me 'fuzzy felt', a candle making kit or a potters wheel, all gifts requiring a bit of creativity and perfect for a child who thoroughly enjoyed her own company. I would make a Christmas card for my Grandma, she was wonderful as she gave me sweets, toys suited for a creative, shy and self contained child, and the most lovely smelling bath cubes. Yet despite all this I can only remember my childhood Christmases being incredibly special. So why do I now view Christmas in such a negative way? My mum dropped a bombshell last weekend, and probably shed some light on my festive negativity. Mum and Dad are now well into their 80's and still live in England. We talk every week on the telephone. My brother and sister emigrated to Australia many years ago. Mum and Dad have no relatives in England, they are totally alone. I asked Mum about her plans for this coming Christmas. My brother and his wife, both their children and their spouses' and a new great grandchild were making the trip from Sydney to Manchester to visit them.. It was going to be an extremely special time. Mum didn't seem particularly excited. I probed further. Mum explained that she did not like Christmas and never had. She went on to vent her feeling on Christmases from the early 1970's, those magical Christmases from my memories. The list was long: she dislike the way her tree was never as beautiful as the next door neighbours, and that the pine needles dropped over the floor. She said that the three of us were constantly bickering over who got the best presents, (as she mentioned this I seem to remember getting a smacked bottom and sent to my bedroom for trying to have a play on my sisters recorder). She loathed all the kerfuffle that went into making a Christmas cake, and all us children ate was the Royal Icing. She moaned that she spent hours in the kitchen cooking a dinner only to have us three children polish it off in a few minutes. She wanted to take the decorations down after boxing day but we wanted them up in all their forlorn handmade glory until at least mid January (Mum won) Her pet hate was my Grandma...her mother-in-law. Gradma was irresponsible, who in their right mind gives a young girl sweeties and bath cubes for Christmas! The tirade was wound up by her explaining she could not drum up enthusiasm for a big family gathering this Christmas and said that she was thankful that all the fuss would be over by the 27th. Then she could get back to normal! Maybe that's why I am not fond of Christmas, who knows? Its a good job I have a great sense of humour and know that deep down my parents love me dearly and are proud of everything I have achieved! I love them to the moon and back as well and am so thankful for the childhood they gave me.I won't book in for expensive counselling sessions, no harm has been done. I know that any lingering emotional scars will be erased by wriggling out of any big social occasion, doing a few rows of knitting or going for a lovely long walk with my dog. We are now well settled in our new store in Milford, it really is a joy to come to work every morning. Our new location has far exceeding all my expectations, I never realized what a smart, busy and forward thinking town Milford is. We are greeting many new customers and the majority of my regular customers are delighted with the more accessible location. Many of you are coming into the store for lighter, summer projects, either to wear to give as gifts. Our knitted dishcloth and pot mitt kits have been tremendously popular, Santa will be amazed at how many of these handmade gifts he has to pop down the chimney! For the last few weeks our window display has featured a real showstopper shawl. I know this attracts passers-by attention as each morning I rub nose prints off the outside of the window! 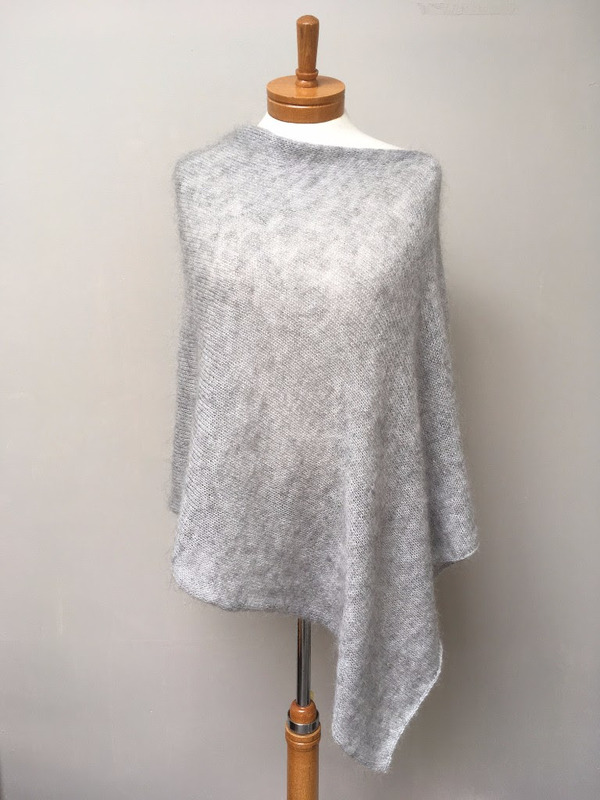 Knitted in silver grey kid mohair combined with a strand of fine merino, our shawl is so easy to make. It is basically a long rectangle of stocking stitch sewn together. My colleague, Marya, made our sample, she is now busy knitting another for her daughter and I have popped some wool away for myself. We are well stocked up with yarn for this stunning shawl, I suggest this is the sort of knitting project to take away on holiday once the Christmas activity is over and you have chance to pop your feet up and relax. Also on display are a couple of samples of our extremely light and airy kid mohair scarf. Just one ball of yarn is needed and using huge 15 mm needles, and stocking stitch (we have jotted down the pattern for you as a freebie) We have many shades available from full on bright shades to muted and understated hues.This project can be completed in a couple of evenings and would be a lovely gift for a special friend. 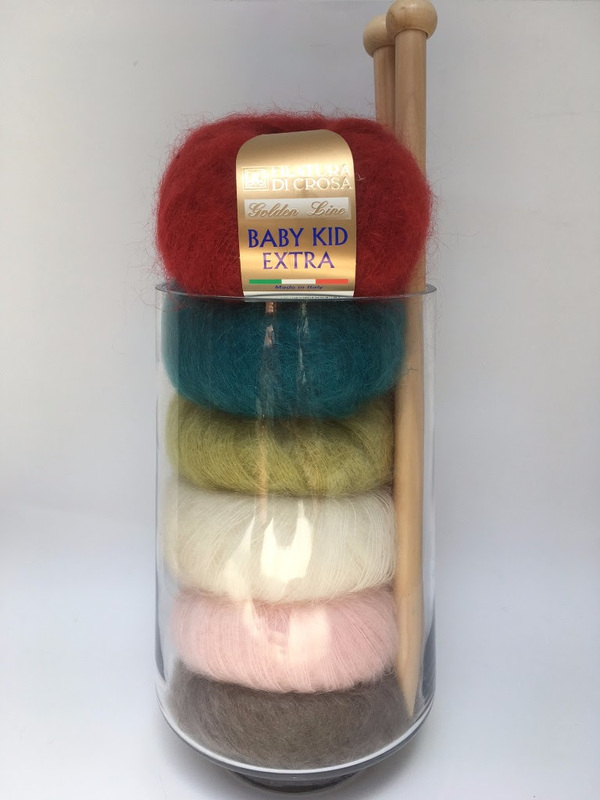 For those of you wanting some exquisite New Zealand wool, our central display table in the store features an assortment of goodies from Touch Yarns. 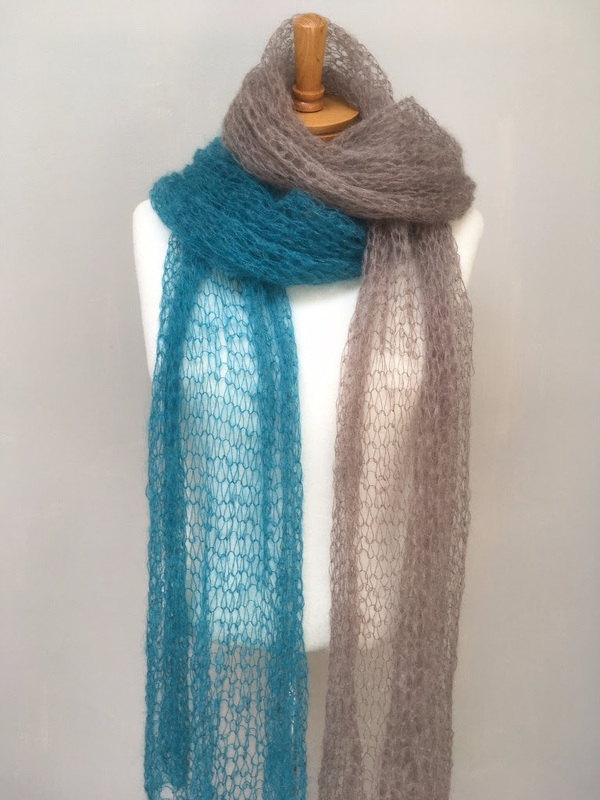 We have tastefully variegated pure merino wool, hand painted possum yarns, Magic Merino sock yarn and our Beachcomber' scarf kit, featuring delicate shades of fine merino inspired by shells found on a North Island beach. For those of you who call in the store regularly, you may notice that my daughter, Francesca is no longer part of our team. She has just completed her degree in 'Sustainability' and is off to Melbourne in a few weeks time. Of course I will miss her terribly, we get on so well and I am incredibly proud of her many great achievements so far. There will be plenty of weekend trips to Melbourne for me going forwards. Francesca has been replaced by Olivia. Olivia is taking a gap year before heading to university, and her main role at the store is to help me launch and manage a web site. I have resisted having an online store for many years, but my Luddite/dinosaur views have changed as I realize many of you are not 'local' and wish to indulge in our lovely yarns. With Olivia in charge of our online store , I will have me more time to chat with customers in the shop. Now just to give you advanced warning...we are taking a good break this year. I am a bit tired after all the work involved in relocating the store to Milford and decided that for the first time in 15 years I will close the shop over this period and also have a holiday. We will be closing mid afternoon on Christmas Eve and not re opening until 3rd January. Just make sure you plan ahead and make sure you don't find yourself stuck without some knitting over the holiday. I will drop you another brief newsletter before the end of the year and hopefully let you know the launch date for our web site. Please don't be quite as apathetic as I am with you Christmas planning, but do try and take some out for yourselves. 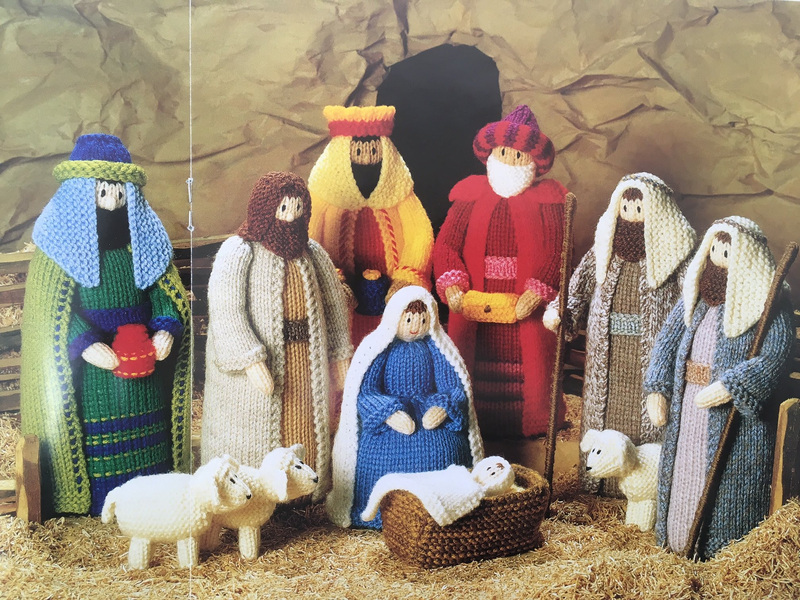 If the weather forecast for the holiday period is inclement you could always pick up a pattern and wool for our knitted Nativity, there's nothing like early planning for Christmas 2018!